There was a mill worth 13s. a year on Winemar de Hanslope's manor in Cosgrove in 1086, which Winemar's successor Robert Maudit granted to Roger the miller of Cosgrove and his son Robert for their lives in 1211, together with three mills in Hanslope, for 100s. a year. 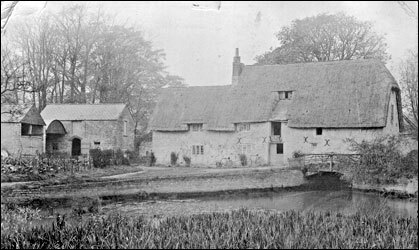 Robert, then described as the miller of Hanslope, quitclaimed the agreement eight years later, and shortly afterwards Robert Maudit granted Cosgrove mill, with a messuage, holme and meadow, to John le Brun of Cosgrove for 40s. a year. 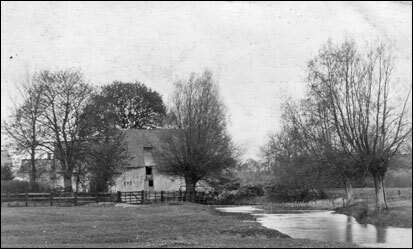 Another Robert Miller of Cosgrove (or Robert of Cosgrove Mill) held land in Furtho in the late 13th century, as did Nicholas Miller of Cosgrove in the 1320s, who had a daughter named Sybil, living in 1350. 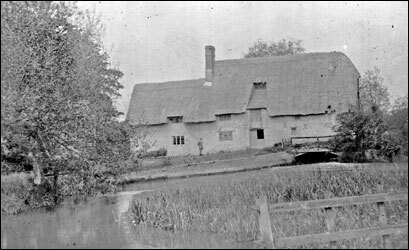 In 1375 Nicholas (on this occasion surnamed 'at Mill') sold the mill and quite an extensive estate in Cosgrove, Old Stratford, Moor End and Potterspury to Robert Champayne; the mill itself and some of the other premises were then held by Margery at Mill for her life. 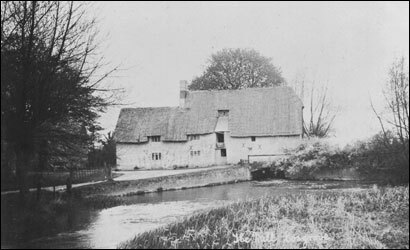 In 1667 Cosgrove mill was said to be let for about £18 a year. John Hutt held the mill from at least the 1740s until his death in 1770, when he was succeeded by his widow. Mrs. Hutt was followed c. 1789 by John Dawson, who died in 1806. Thomas Dawson was the miller at Cosgrove from the 1840s, if not earlier, until his death in 1878. He was succeeded by Thomas Amos, who carried out some improvements, although his landlord complained that he was costing more in repairs than his rent was worth. 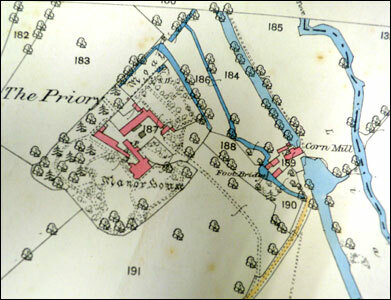 The mill was included in the sale of Cosgrove Priory and grounds by Alexander Grant-Thorold in 1886. Amos left in the mid 1890s and thereafter the mill seems to have gone out of use, although many years later it was said to have worked until 1928, when the adjoining house was occupied by a Mr. Simpson. 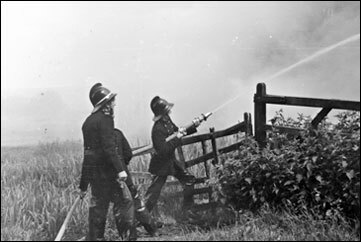 It then stood empty until 1971 when it was burnt down. 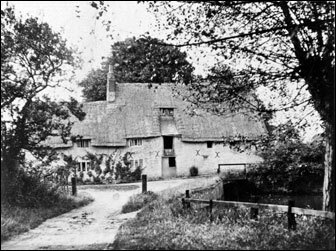 In 1979 Sir Hereward Wake, the owner of the Cosgrove Priory estate, applied for planning consent to restore the mill for residential use. From: 'Cosgrove', A History of the County of Northampton: Volume 5: The Hundred of Cleley (2002), pp. 77-98. 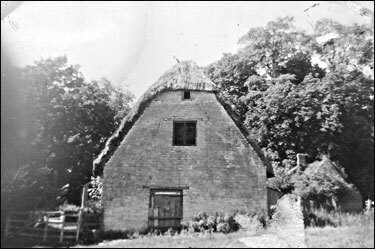 We know that there have been several different sites for mills at Cosgrove. 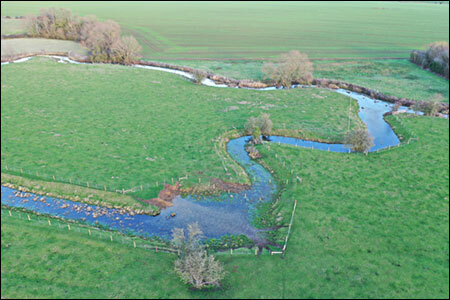 The aerial photograph on the left shows how the old mill race beyond the Green still lies to the west of the River Tove. 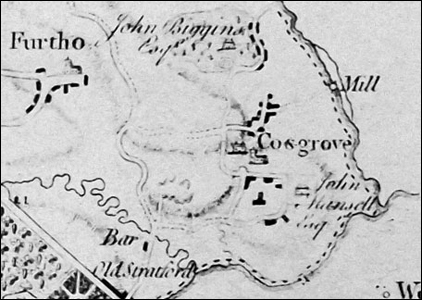 This is recorded on Eyres map of 1799 on the right. The race is very straight , belying its man-made origins. 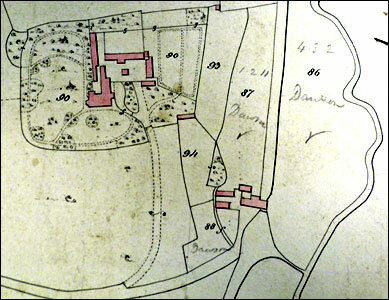 The new mill site and building must therefore have been adopted during the time of the Dawsons. 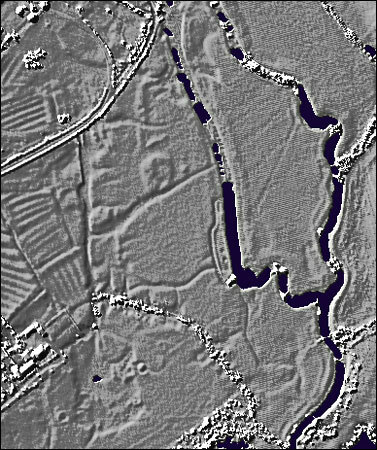 The Lidar image on the left, compared with the aerial image of the mill race,shows the site of a previous track running past the outline, perhaps of some mill buildings. 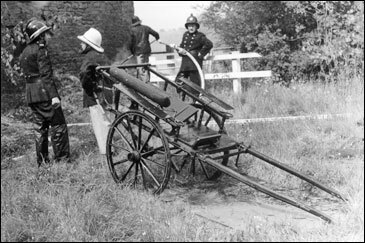 WAGONS, CARTS, HARNESS, &c., &c.
On the premises of the late Mr. Thomas Dawson, deceased. COMPRISING dining, folding, and Pembroke tables, Windsor chairs, timepiece under glass shade, clocks, glass, china and earthenware, feather beds, bolsters and pillows, bedsteads, linen sheets, blankets, mahogany swing glasses, chests of drawers, washstands, toilet tables, all the kitchen requisites, barrels, wheelbarrows, thiller and trace harness, tilted wagons, carts, &c., &c.
For further particulars see catalogues in circulation. Sale to commence at One o'clock. 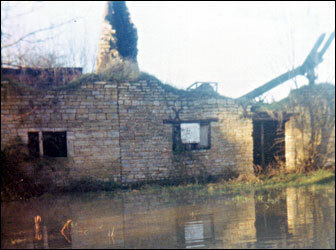 COSGROVE MILL, near STONY STRATFORD. ALL the very useful HOUSEHOLD FURNITURE and Effects, Wagons, Carts, Harness, &c.
On THURSDAY, JULY 11th, 1878, on the premises of the late Mr. T. Dawson, deceased. 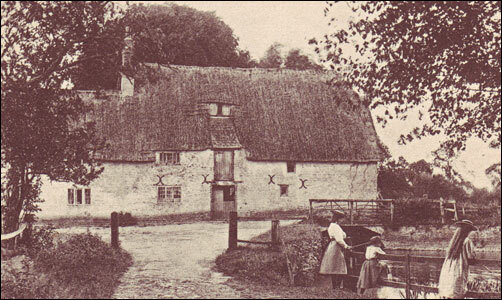 A typical scene outside Cosgrove Mill, c.1880. Thomas Amos, a farmer and maltster from Castlethorpe. Has sent corn to be ground at the mill. 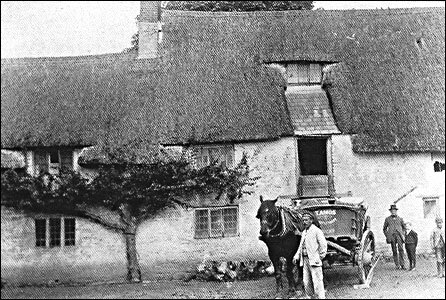 Mr Brinson was living in the cottage on the left at the time, and may be the gentleman on the right with his son. Now for Cosgrove Mill. This was rented by Thomas Amos, the miller, John Hill, the carter, and Harry Panter. It consisted of a pair of barley stones, a pair of wheat stones and a crusher. 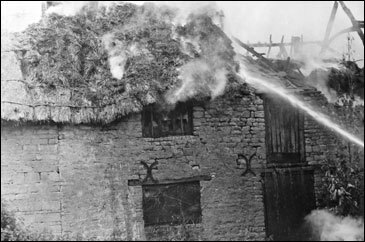 105 The Malking Close Cottage &c.
102 The "Plough Inn" &c.
The 400 years old mill at Cosgrove Priory was badly damaged by fire on Monday. 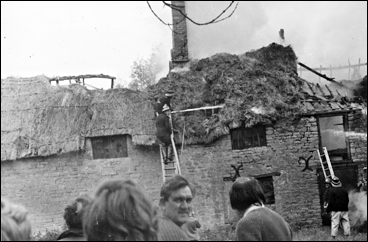 Only a quarter of the huge thatched roof was saved and 50 per cent of the structure was destroyed. The large mill wheel was badly damaged by falling debris which set it alight. 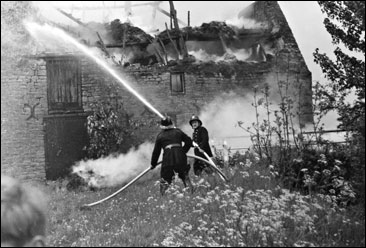 A strong wind hampered the work of firemen. 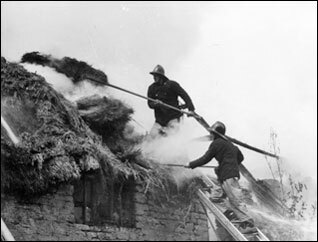 Thatched roofs on two adjoining sheds were also badly damaged in the blaze. The late owner of the mill, Captain Philip Y. Atkinson, died a few weeks ago and his wife, Grace, was staying with relatives at the time of the fire. 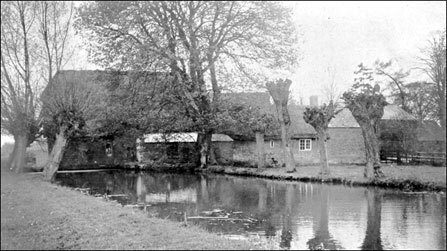 Cosgrove mill is thought to have been mentioned in the Domesday Book but since the 11th century it has almost certainly been rebuilt several times. The present building is thought to date back 400 years. 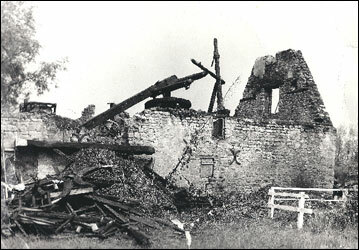 Cosgrove Mill before the fire. 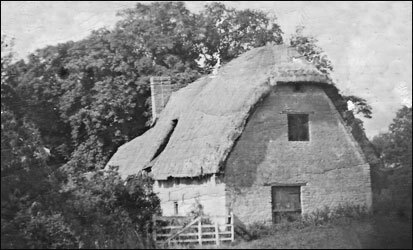 There have always been stay-at-homes as well as those infected with the wanderlust, and it was no unusual thing in the old days for people to spend the whole of their lives in one village, seldom or never spending more than a few hours away from it. Such a one was Mr Dawson, the Cosgrove miller, who lived in the last of the coaching days. A friend of his persuaded him one day to go with him to London for a holiday. They climbed onto the top of the coach on the Watling Street, and as they got near to London it began to rain. “Have you got your umbrella?” said his friend. “You can’t borrow an umbrella in London!” was the somewhat scornful reply. “Damn-damn-double-damn!” cried the miller, “Why, anyone in Stony Stratford’d lend me an umbrella!”  and back he went to Cosgrove by the next coach, and that was the only night he ever spent away from his native place in all his life. 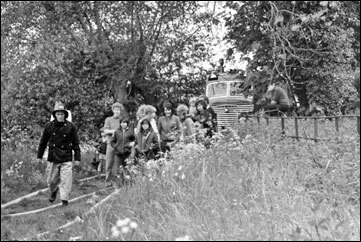 This story was told to me by a Northampton friend who spent his boyhood at Cosgrove. I found Dawson’s name on a charity deed a year or two ago, and Mr Jack Brown told me he had heard speak of him as Dammy Dawson. Fine, 13 John (1211  12), between Robert Maudit pet., and Roger Miller (Molindinarium) ten., concerning two mills with appurtenances in Hanslap, and of one MILL with appurtenances in Cosgrove, of which plea was made between them in the same court, viz that the aforesaid Roger acknowledgde the aforesaid three mills with their appurtenances to be of the right of the said Robert. And for this Robert granted to Roger the aforesaid three mills with all their appurtenances. And further granted to the same Roger one other mill in Hanslap, viz. 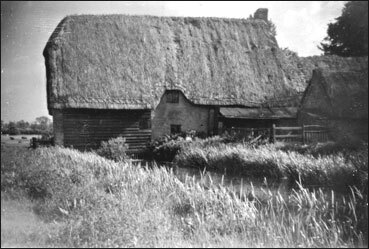 That mill which is between the fish pond and Harshull with pasture extending etc., and one croft extending etc to have and to hold to the said Roger and Robert his eldest son for the whole of their lives of the same Robert [Maudit] and his heirs for the free service of 100s yearly for all services and exactions etc. Quitclaim by Robert, son of Roger the miller of Hanslope, to the king’s chamberlain Robert Maudit (II), in return for his aid and maintenance, of an agreement Robert (II) had made with Roger in the king’s court, concerning four mills which he held of Robert (II) in Hanslope and Cosgrove, 24 June 1219. Note: by a concord 2 Nov 1211 Robert Maudit (II) granted three mills in Hnslope and one in Cosgrove to Roger and his oldest son Robert for their lifetimes, by free service of 100s yearly (CP 25(I), 173/13, no 236). See no 214 here. Editor had translated quitclaimor’s as above from “Robert filium Rogeri molendinarii de Hamslap”, Robert also called Roberty molendinarii elsewhere in charter. 1219 24 June. Quitclaim by Robert, son of Roger the miller of Hanslope. To Robert II Maudit, in return for his aid and maintenance of an agreement Robert II had made with Roger concerning 4 mills which he held of Robert II in Hanslope and Cosgrove. 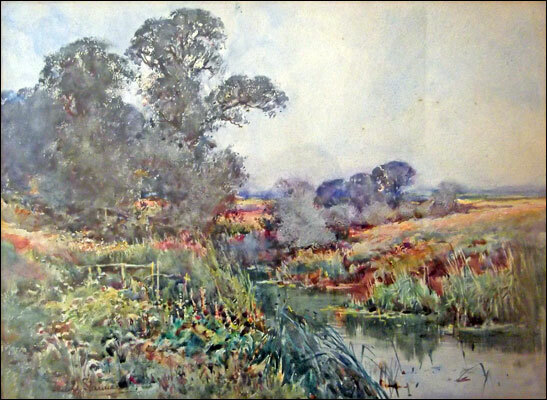 Calendar: Grant by the king’s chamberlain Robert Maudit (II) to Joh le Brun of Cosgrove of the mill there with its messuage and a river meadow in Cottesmore (Rutland). 1219 x 1222. Text: Grant to John le Brun of Cosgrove, for his homage and service, of the mill of Cosgrove, with mess., which belongs to the said mill, and the holme and meadow in Kutesmor, which Roger the miller held in the time of King John father of King Henry. Rent 40s a year. Dating note  later than no 217. Kutesmor has been calendared as Cottesmore, but from context looks like the name of a meadow in Cosgrove. *Robert of the Mill(s) of Cosgrove to Adam le Coupere of Fortho for homage, service and a mark, of a place of land with curtilage and croft in Fortho in Cleycroft stretching from the king’s highway into the breach between land of the same Adam and land once of Agnes de Chayne, and a gore with ditches and living trees, abutting in Luttlehull, stretching to le Broc, between the king’s highway and land of Agnes de Cheyne. Also noted uner Firtho, Misc Deeds. Alexander de Cheyne to Richard de Lyvende and Murial his wife for service and 10s. of a rood in Furtho lying in the furlong called Littlehul between land of the church of Furtho and of Robert the miller of Cosgrove, in breath stretching to the headland of John de Brochole. 1 Jan 1320. William de Lillingston, chaplain, to Peter de Livenden and Edith his wife of 2 selions of land lying together in the field of Cosgrove in a furlong called le Brech between land of John de Tingewich on both sides, abutting at once on the Northampton road and at the other on a headland of Nicholas of the Mill of Cosgrove which he has by the gift of Geoffery son of John le Mason of Eastpury. 30 Jan. 1321. 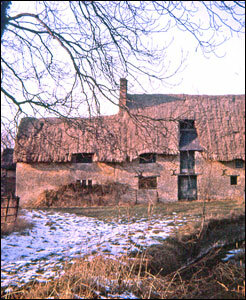 Nichols of the Mill(s) of Cosgrove to Peter de Lyvedene of Furtho and Edith his wife of 5 selions of arable in a furlong called Cleycroft in the parish of Furtho, 3 selions together lying between the land of Peter de Liveden and of Nicholas de Liveden, which he holds for the life of John de Tyngewyk, and 2 selions lying together also next land of Nicholas de Liveden. For life of grantees, for 1d at Michaelmas. 6 Feb. 1323. 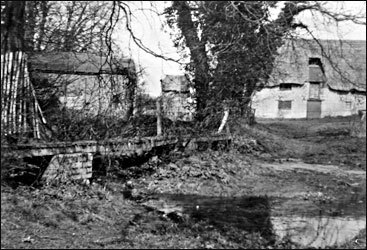 Robert Koc of Hulcote and Sara his wife to Peter de Liveden and Edith his wife, of a messuage in Furtho, half a messuage once of Adam le Coupere and a selion of land abutting on same in le Couperscroft, which half a curtilage which Adam had by grant of Robert of the Mill, the messuage lying between tenement of Nicholas of the Mill and one of Isolda sister of Sarra. 22 Feb. 1323. Isolda le Coupre of Furtho to Peter Liveden of Furtho and Edith his wife. Messuage in Furtho, viz. half a messuage once Adam le Coupere my father and a selion of land abutting on same in Couperes croft, croft, with half a curtilage which Adam had by grant of Robert of the Mill of Cosgrove, messuage, between messuage of Peter and ten. of Henry lord of Furtho. 20 Jan. 1350. Adam de Tonsemer of Cosgrove to John de Liveden of Furtho and Sibilla daughter of late Nicholas of the Mills of Cosgrove, of all lands in Furtho, Cosgrove and Hanslope had by grant of the said John. John Swetekoc of Covesgrove and Isabel late the dau. of John ate Wode of Estperia his (John’s) wife, grant to Stephen the reeve of Haversham and Alice dau. of the said John ate Wode his wife for four marks of silver of one mess. with a wooded curtilage adjoining and all other appts. in the village of Estperia, viz, that mess. which the grantors had of the inheritance of Isobel after the death of John ate Wode her father. To the use of Stephen and Alice for their lives and afterwards to the heirs of Alice, rendering to the grantors 3d yearly. Witn Yvo Gobion, John Gobion, Roger de la More of Jerdele, Hugh de Blakewelle, Richard ate Wode, Walter Anncol’, Richard Illing, Robert of Covesgrave Mill, John son of John de Barnuelle and others. Final concord, quindene of Trinity 46 Edw III 913720 and afterwards in the octave of the Purification 49 Edw III (1375) between Robert Champayne quer and Nicholas at Mille of Cosgrove defct, 10 mess, one mill, one dovecote, 114a land, 17a meadow, 2a pasture and 3s 3½d rent with appts in Cosgrove, Stratford, Moorend and Potterspury. Nicholas recognises the tens to be of the right of Robert, which the same Robert has 8 mess, the aforesaid dovecote, 31a land, 28a meadow and the afsd rent of the gift of Nicholas to hold to Robert and his heirs for due service forever. Are all of the inheritance of the said Nicholas at Mille on the day this concord was made. And after the deaths of Margery, Isabel and Sarah they should remain to Robert and his heirs, together with the other premises. Warranty by Nicholas. Robert gave Nicholas 200 marks. This concord was made in the presence of Margery, John and Isabel and Nichols fitz Hugh and Sarah and with their agreement. Churchwarden’s accounts for 1743/4 include an entry for “John Hutt for the mils” 3s 9d. The same amounts with just John Hutt’s name and no reference to the mills appears the previous year. Also in 1741 and 1742.
last levy in the book 1771-2 has an entry for Widow Hutt for the mills. Overseers accounts levy 1787 Mrs Hutt pays for the mill, of list for 1789 for the same amount of 13s in same position in the list as John Dawson for Mills. Presumably Mrs Hutt has been at the Mill since her husband died and the changeover appears towards the end of the churchwarden’s accounts. 1798 Poor law levy includes John Dawson, presumably at the mill. Also John Pittam, malting, which appears to replace earlier entry for Franklin. 1 May 1878. J Carr, Padbury Bucks, to James Reed, Cosgrove. Poor old Dawson is not more. Do you know if mill is promised to anyone? Is there any chance for me? 13 May 1878. Mansel to Fisher. Willison wished to become tenant of mill but I will not have him or any of his sons there. No doubt they intend to sell off and do as Dawson did but you must prevent that and tell them I shall not allow it. Have you found Dawson’s agreement? I have had another offer for the mill. 6 Aug 1878. Thomas Amos, Castlethorpe, to Fisher. I have settled with Bennett and Willison about the mill and shall enter on 8th inst. Would like to see you on the matter. 3 May 1878. Copy of newspaper notice of meeting of creditors of late Thomas Dawson of Cosgrove Mill, 7 May 1878 as to best way of winding up his affairs. 16 Sept 1879. Mansel to Fisher. Wish to see you on various matters. Matter of mill is very serious and outlay will be much more than ought to be called upon to pay. 13 April 1881. John Christopher Mansel to Fisher. You must see Amos about the state of the mill, and if he is to neglect the place in the way in which he is now doing he must be given notice. It is costing me considerably more in repairs than the place is worth and it will be cheaper for me to put it up. Most of the work I did last summer is taken away by flood (not his fault) but the new wheel is also broken owing to his man working it during frost when ice was coming down. Amos does good business at the mill and rather than stop for a day lets his man do all sorts of mischief. If he does not put the wheel in order we must take proceedings against him. Do not believe he intends to do anything and it will be as well to get rid of him. I will be better off without his rent at £30 a year even if I cannot get another tenant. 31 Jan 1979. Planning application from Peter Haddon and Partners on behalf of Sir Hereward Wake and Courteenhall Estate to restore Priory Mill. South Northants ask for any known history, especially last residential use. 28 Feb. Clerk has written to SNDC saying mill last worked as such in 1928 and that adjoining house was then occupied by a Mr Simpson [no record of this name]. 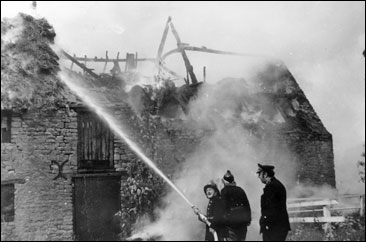 It was then empty until 1971 when it was burned down and had been derelict since. 25 April. 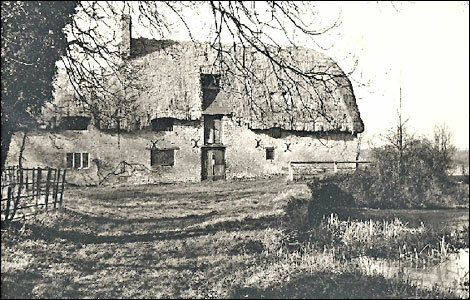 South Northants Disrict Council have told Haddon that planning permission will be needed for restoration of mill. 30 May 1979. Application received for restoration of Priory Mill to four bedroomed detached dwelling. No objections. 25 July. SNDC have refused application for residential conversion of mill. 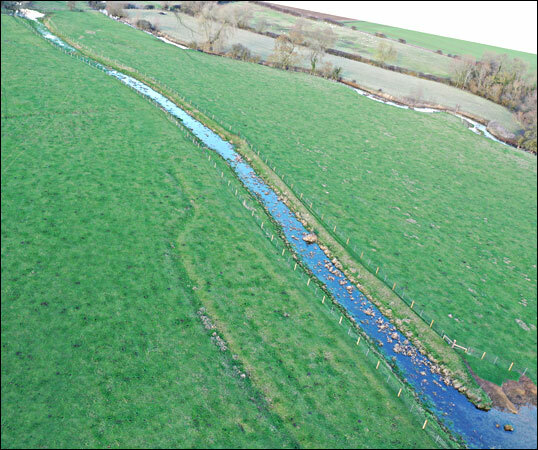 28 Nov. Notice of appeal over mill decision from SNDC. Parish council support appeal. Mill refusal to be appealed to Dept of Enviroment. Council reiterate support. 30 July 1980. DoE have dismissed appeal.